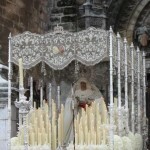 Despite some differences between various branches of the Christian religion, the embroidery still occupies a leading position in the decoration of both Orthodox and Catholic churches. Known as Ecclesiastical, the embroidery art appeared in ancient times, but preserved only embroidery for church purposes from the tenth century. The embroidery of the beginning of the tenth century is in The Treasury Museum of Durham Cathedral, and fragments of the altar of the same century – in the National Museum in Ravenna. 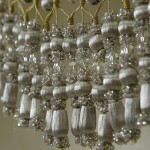 In fact, beautifully embroidered items appeared in the early eleventh century. And among them – the paintings, embroidered with pure gold, stored in the cathedral of Bamberg; coronation mantle of Hungary, and other samples. Meanwhile, this embroidery shows both costly materials and skills in their performance, and also the deep meaning of the embroidered paintings. 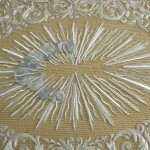 Traditionally, until the thirteenth century gold thread used in embroidery for church purposes. 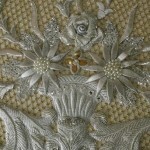 To some extent, fabric with gold thread replaced the gold embroidery. 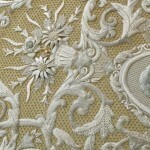 Therefore, the fabric was very reminiscent of embroidery, woven of gold, and could easily be mistaken for such. In fact, church embroidery reached its highest development in the thirteenth, fourteenth, and the first half of the fifteenth century. 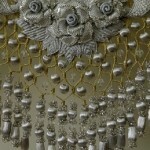 During this period in the embroidery used gold, silver and silk threads, sequins, enamel, pearls, gemstones, diamond grit and corals. 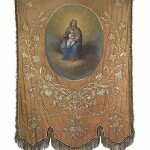 Bright pictorial embroidery, deeply religious in nature, adorned liturgical clothes, blankets and tapestries. 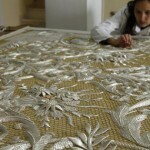 Meanwhile, in the eleventh and twelfth centuries, Sicily became famous for its ecclesiastical embroidery. And in the thirteenth and fourteenth centuries masters of England became famous. 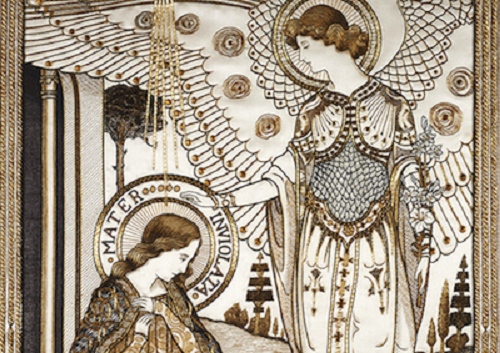 Richly embroidered vestments from England got to other parts of Western Europe. A large number of excellent church crafts, magnificent examples of which still exist, produced in particularly, in Germany, France and Italy. In the fifteenth century appeared the best ecclesiastical embroidery made in Flanders. 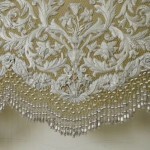 Gold thread embroidery combined with colored silks. 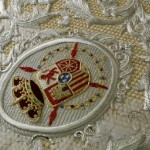 The best examples of this vestments – the Order of the Golden Fleece, preserved in the Hofburg in Vienna. However, in the Middle Ages embroidery began to change – it became more vivid, and often quite inappropriate for the church embroidery. In addition, the tendency to focus on shiny effects and majestic splendor constantly grew. 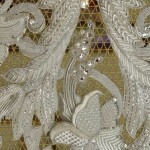 At the same time, the graphic embroidery was reducing, due to the influence of secular embroidery. Besides, crafts for church vestments were more limited by purely decorative designs, taken mainly from the plant world, as well as some symbolic designs. Meanwhile, church embroidery art flourished in the various provinces of the Byzantine Empire. 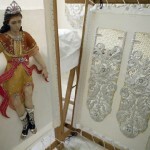 Although expensive handicrafts produced in the Greek church, still embroidery continued to come from Western Europe. However, Byzantine needlework had no effect on the Western church embroidery. One of the best examples of art crafts of the Byzantine Empire of the Middle Ages is in the treasury of St. Peter’s Basilica in Rome. Mistakenly attributed to the eleventh century, in fact, it is the work of masters of the Greek church of the second half of the fourteenth century. 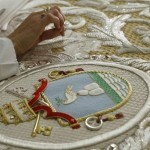 Art of church embroidery differs from secular embroidery. 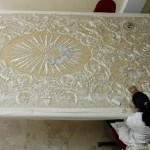 However, the basic stitches and artistic methods were similar. 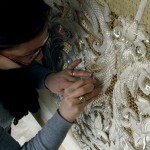 Good taste, sense of color, skill, hard and painstaking work were also the same.